Firefighters received a 9-1-1 call at 4:50p.m., on Tuesday afternoon reporting a fire in a two-story split-level home consumed in heavy smoke at the 14200 Block of 84th Avenue in Orland Park. One resident was outside the building and informed firefighters that two other individuals were still inside the home. Using a landline, firefighters entered the smoke-filled home in search of the missing residents. The firefighters were able to rescue two people from inside the building. All three members of one family (father, mother, and son) were treated for smoke inhalation at the scene. One of the victims, the father in his 90s, however, is in critical condition and was transported to Christ Hospital for continued treatment. The mother, also in her 90s, was treated at the scene and released. A full still alarm was called to provide manpower to the scene and support. The Illinois State Fire Marshall and Orland investigators are currently on scene investigating the cause of the fire. 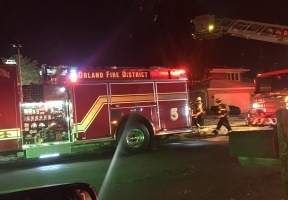 The Orland Fire Protection DIstrict was assisted by neighboring Fire Districts including from Palos Fire, Oak Forest, Tinley Park, Homer, Lockport, Crestwood, New Lenox and Matteson. The identities of the victims are not yet available.